It's a nice cool evening here in central Florida and tonight I felt like I was on cloud nine. Sitting inside the pavilion at the Strawberry Festival, waiting to see one of my favorite country artists, Rodney Atkins. The last time I saw him was in Knoxville, Tennessee in 2010. I was so excited when the lights went dim and the "National Anthem" started to play, singing along with my right hand over my heart, I glanced over to the stage, Atkins had snuck out and was standing there with his ball cap in hand, covering his heart, just like everyone else. There's no better song to follow the National Anthem then "It's America". This was the start to a great night from the man who is often referred to as the "guy in the ball cap" or "the all American Country boy". He entertained the audience of several hundred for nearly ninety minutes. He sang all the favorites, "Tell A Country Boy", "He's Mine", Cabin In The Woods", and "Wasted Whiskey". He kept the fun loving crowd on their feet and singing along all night. Another cool thing he did was toss the microphone out randomly to the audience, allowing his fans to sing. "Does anybody like tractors, drive tractors out there" Atkins asked. Before he could get another word out the audience started singing, "I woke up the same way this morning / Like a stranger in my own life," the first line from "A Man On A Tractor". The smile on his face was priceless. Much to our delight he went on to perform his big hits "Farmer's Daughter", and one of my favorite tunes, "Watching You", from his sophomore, platinum album, "If You're Going Through Hell". He asked the audience "Does anyone out there have daughters" and of course the crowd went ballistic! He let out a little chuckle and said, "You know where I will be, at home watchin' a little tv, and up all night cleaning my gun," as he transitioned into his hit song, "Cleaning This Gun". Then he asked the audience, "How did ya'll get to the Strawberry Festival tonight? I know you drove, but how did you get here?" The answers were random, one guy said a car, one said she walked, and another rode his bike. "Okay all good answers, me and the guys came in the," somebody shouted out "bus"! It was great, he laughed and told us "yeah by bus but... we came on the 'back roads,'" as he began to sing the title cut, and number one hit, from his fourth album, "Take A Back Road". He closed his show with the, always popular, fan favorite, "These Are My People" but the hand clapping, foot stomping, chants from the audience for an encore, brought Atkins back out on the stage. He told us a story about his trip over seas to Afghanistan and Kuwait to perform for the troops. He told us, at three am he woke up, needing to go the bathroom, "also know as the latrine", for those of you who don't know military lingo. He said, "I had to walk about fifty feet or so to the porta potty and it was about twenty five degrees outside. I was freezing, teeth chattering and all. I passed a soldier picking up fifty pound bags of sand and carrying them about twenty five yards or so before dropping them, picking them back up, and carrying them back, dropping, and picking them up again. I stood there in fascination, wondering what he was doing. Before I could ask he looked over at me and said, "Mr.Atkins, what are you doing out here in the cold this time of the morning?" "My reply, well I was gonna ask you the same thing". to the troops everywhere. As he thanked everyone for coming out he said, "Keep those men and women in your prayers and in your hearts". The love and passion he has for his fans, his music, and the men and women in the armed forces shone through as brightly as the north star. 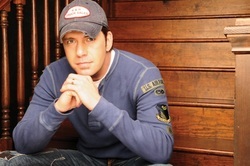 As a journalist I try not to be biased but Rodney Atkins' charming, loving, caring persona makes it impossible not to be. He is truly a class act.